A few weeks ago, I was invited to preview a special product launch from HP; all I knew was that it was a highly anticipated laptop and that I wouldn't be allowed to share photos of the actual product until its release. The suspense was high. I snapchatted from the event, doing my best to quickly whiz by the actual product; if I couldn't avoid it, I'd draw blue squiggly lines all over it. I was being a bit of a tease for sure. 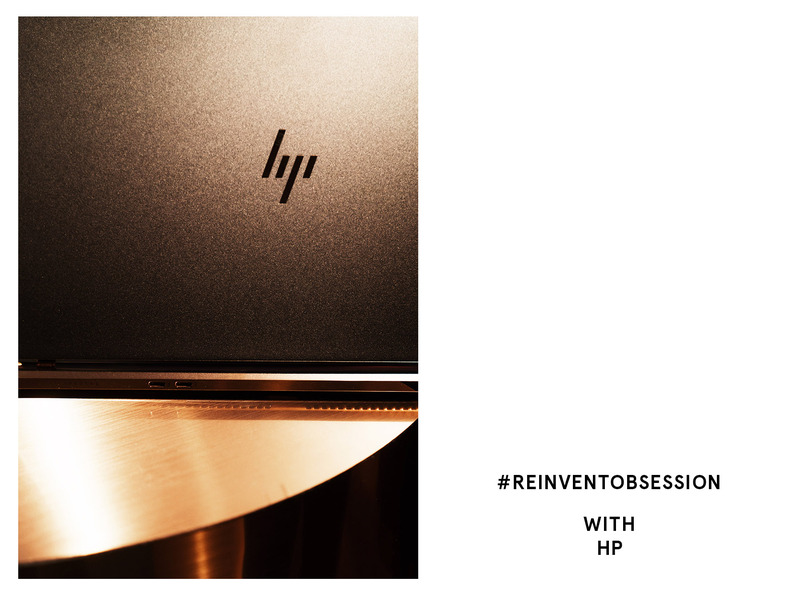 If you haven't heard the news by now, the product that launched was the Spectre laptop, HP's new luxury PC inspired by the idea of reinventing obsession. I am all about the details and was genuinely surprised by how much thought was put into this laptop's design. (To be honest, my last real memories of HP involved a printer I had in middle school, and it was only all about practicality and not so much design back then!) For one, it's the thinnest laptop in the world and probably weighs less than my burrito bowl lunch somedays. There's a nifty hinge that makes for a sleek clean look. You can geek out over the technical specs on the product page if you'd like. I was also drawn to the more minimal logo design that was made to differentiate this line of products. But the most apparent design feature that got my attention was the color scheme – a mix of ash-colored matte aluminum with a glossy copper trim. It was clearly a theme played up at the reveal event as well. Coincidentally my shoes with their copper/rose gold inlay in the heel totally matched the new product. I obviously had no idea what I was in for that night, so it was extra fun to discover this. 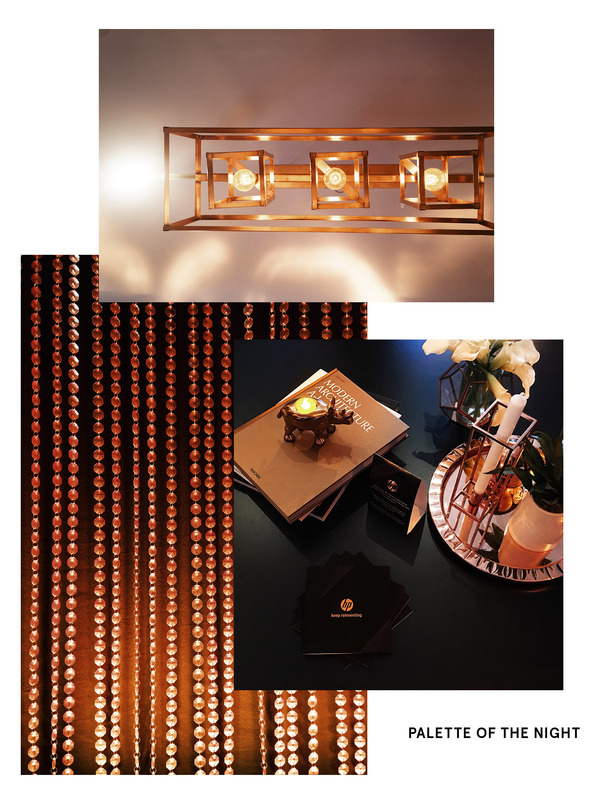 I guess you could say I'm obsessed with the idea of copper accents. Now I just need to find more clothing items that incorporate that! We were in for more discovery that night with the reveal of two special designer collaborations. There's a nice 'making of' video featuring the two artists and how they really reinvented the base laptop. I personally have met Jess a few times and love her aesthetic. The colors and designs are classy af! Haha. I've switched to Mac but I remember having most of my laptops (if not all) before that as HP. I really think they're a reliable brand and it's so good that they're finally putting a lot of effort into product image. WOW! HP really did a great job! They look so much classier and higher end than any other laptop. I love the copper and ash tons that makes it completely stand out but not in an obnoxious way (like the gold Macbook Pro). The designer collaborated designs look so good too. Oooh where are the shoes from? I'm sure you have a ton of things in the works but would love to see a post on what you're loving in terms of clothes these days - I know the post before this has that gorgeous JW Anderson top but I'd love to see what else is catching your eye.. I'm so bored of my wardrobe (when did everything become shapeless and neutral??) but haven't seen much even in terms of elevated basics that I am loving in stores these days..